Hello, everyone, it's Audrey! And, hi, Pam! Again, thank you so much for allowing me to be here today! I'm still going through a difficult period right now which isn't allowing me time for crafting and/or blog visiting, but I truly miss you all and I've been fortunate (and blessed) to be able to literally "squeeze" in time to get here for my monthly DT projects, thank God!!! Unfortunately, due to time restraints, today's project will also be short --but sweet!!! You'll see what I mean and, judging from past projects like this, I think you'll like it! I hope so anyway... lol! Shake the ingredients until the oils and liquids have all blended well; pour into decorative bottles, embellish bottles if you wish. 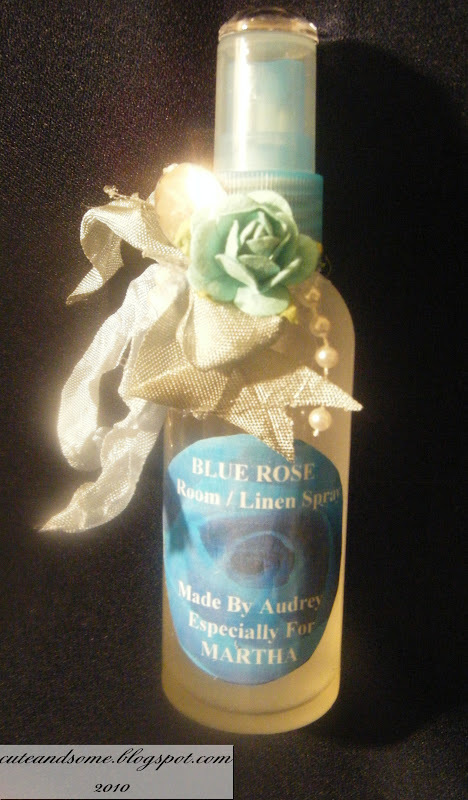 Let the spray sit for at least 24 hours before using -- the longer it ages, the stronger the scent becomes!!! Now, it's ready!!! Enjoy!!! P.S. As with most liquids and oils, the oils can separate - just shake the mixture before use if this happens. 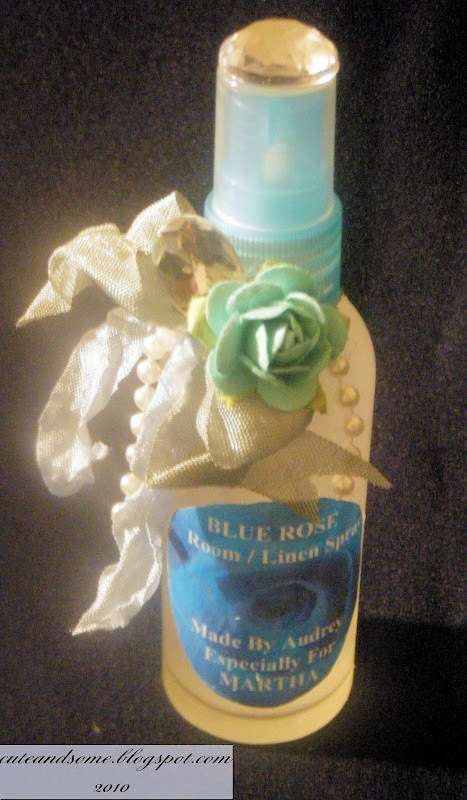 I called mine "Blue Rose" because I used a rose-scented essential oil but added just a hint of lavender too! It smells delicious!!! Of course, the rose embellishment and background label is blue... hence the name! You'll use whatever scent you prefer! Try blending a few to see what you come up with!!! Any questions, please click on my name above at the top of this post which is a direct link to my blog where you can leave me a comment and/or email me at audreyfrel@sbcglobal.net. Due to my circumstance, it may take me a few to get back to you -- but I will!!! Hugs and love you all! I'll be seeing you! Beautiful project Audrey. Love how soft and pretty it looks... bet is smells great too. We miss you and hope things get better soon for you. Ohhh I've never made a scented spray before - thanks for the recipe! I love how you decorated the bottle too. Thanks for sharing!